Out of 100 billion possible combination of these eleven numbers, Swan reveals the ONE combination that unlocks the secrets to a fulfilling life! Men will never forget it! 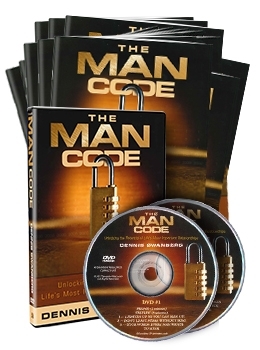 An interactive video curriculum, The ManCode comes with a Leader kit, DVD kit, CD kit, ManCode field manual, and leader guide. The six exciting ManCode Sessions include Lighten up so you can man up!, Dont leave home without him!, Four words every man wants to hear! Shaped and sharpened by a few good men, What you need more than it needs you and Man up for the multiplied life! Need a different ManCode Kit package? When purchasing online orders, customers may experience a delays due to holiday closures.